Modern life is hectic. If you are looking to boost your wellbeing, increase your energy levels, lift your mood and hydrate your body, Vitamin IV Infusions are ideal. 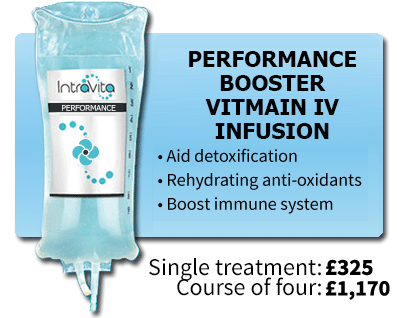 Favoured by celebrities such as Madonna, Simon Cowell and Rihanna, Vitamin IV Infusions are an easy, effective way of delivering vitamins, minerals and amino acids directly into your bloodstream via an IV (intravenous) drip. Vitamins are essential for normal growth and staying healthy – but our bodies can’t produce all of the nutrients we need to function and thrive. That’s why more than one in three people take daily vitamin supplements – often without realising that only 15% of the active nutrients consumed orally actually find their way into their bloodstream. With Vitamin IV Infusions, the nutrients enter your bloodstream directly and immediately, and are delivered straight to your cells. We offer four different Vitamin IV Infusions, so you can choose the best combination for your personal needs, while boosting your general health, energy and wellbeing. Named after its creator, Baltimore physician John Myers – a pioneer in the field of IV vitamins and minerals – this is the ideal first-time product for anyone looking to feel recharged and revitalised. The formula includes Vitamin C, Vitamin B5, B6, B12, B Complex, Magnesium, Calcium, Selenium, Zinc and Glutathione. This treatment features a high dose of Glutathione, also known as the “master antioxidant”, thanks to its ability to neutralise free radicals and prevent cellular damage. Other key ingredients include Vitamin C, Vitamins B5, B6, B12, Cysteine and Glycine. 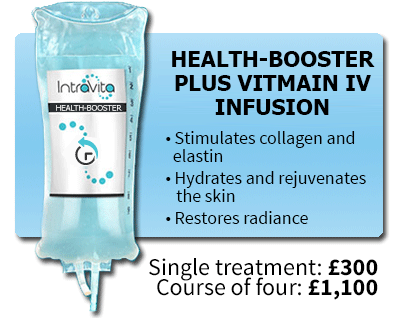 This infusion blend can help to fight the signs and symptoms of ageing for complete body and skin rejuvenation. 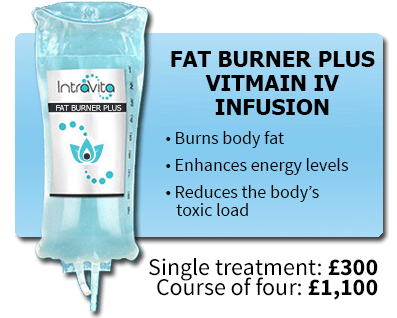 This infusion combines a specific blend of vitamins, minerals and amino acids that can help to reduce toxic load and help the body function effectively in order to burn off stubborn fat. It includes Taurine – a detoxifier and digestion aid – and Zinc, which affects the regulation of blood sugar. This infusion features higher doses of the B vitamins, as they are essential for the body’s production and use of energy. It also includes higher doses of Magnesium – a critical component of the production of ATP, the main source of energy in cells – plus energy-boosting amino acids such as Taurine. Our new Recovery IV Infusion features Vitamin C, a powerful anti-oxidant, to aid detoxification and rehydration, and boost your immune system, general wellbeing and energy levels. You can resume your daily activities almost immediately. No. You may feel a slight pinching sensation as the IV needle is inserted, but the infusion process itself is painless. Each IV Infusion takes around 30 minutes, plus a 15-minute consultation before your first treatment. After your initial consultation, your Vitamin Infusion will be administered intravenously by our Nurse Prescriber. During the treatment, you can read a book, listen to music or just sit back and relax. Many patients begin to feel the beneficial effects during the IV treatment, which then continue over the following hours and days, leaving you feeling and looking refreshed, re-energised and revitalised. For optimum results, a course of IV Infusions is recommended, followed by monthly maintenance treatments. Please note: As with any intravenous procedure, there is a risk of infection. Treatment effects vary depending on the patient. To ensure suitability your initial treatment includes a consultation.